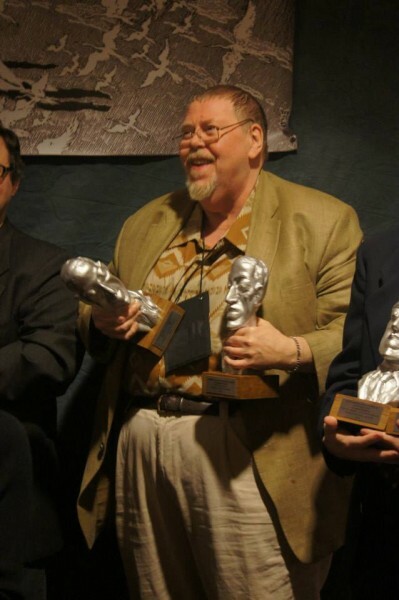 DANGEROUS WOMEN, the big crossgenre anthology that Gardner Dozois and I edited for Tor, was announced as the winner of the World Fantasy Award for Best Anthology of 2013 on Sunday, at the World Fantasy Convention in Washington, DC. I wasn't able to attend the con this year (I do hope to be at next year's event, in Saratoga), but Gardner was on hand, and accepted for the both of us. The news came as a pleasant surprise... nay, even a shock. Neither Gardner nor I thought we had a prayer of winning. The anthology shortlist was very strong this year. But this one is case where I was glad to be proved wrong. For those of you who missed DANGEROUS WOMEN in hardcover, the anthology is being released in mass market (in three volumes) by Tor in the US and HarperVoyager in the UK. All three of the British paperbacks and the first two of the American are on the stands, and available from Amazon and other online booksellers. Gardner and I are very proud of this one. We hope you check it out. This is my third Howard. I won Best Novella for "The Skin Trade" a couple of decades ago, and more recently a Lifetime Achievement Award... which I guess makes this one a post-lifetime achievement. I look forward to lining up my three HPLs on the mantlepiece. Going for the Easter Island effect? Congratulations! Congrats, and thank you for posting photos of the award! I knew that it was a bust of H P Lovecraft (which has been controversial in the past), but I never actually knew what it looked like. It's...distinctive. I think you said you guys are done with "Old Venus". Anything else you two are working on? "Rogues" was like a gateway drug for me--not only did it make me want to read more of Lisa Tuttle's work, but it got me into Gillian Flynn (because I seem to be the only one on the planet who hadn't already read "Gone Girl"). No new anthologies with Gargy in the works at the moment. I am working on another Wild Cards volume, HIGH STAKES. I loved Shadows for Silence in the Forests of Hell. I have never been to a con. This is one of the few near my house (I live near Dulles Airport) and they just extended the train out here. I was thinking about hopping on a train and checking it out. It looks like more of a trade convention for professional writers/editors, etc... but they seemed to have some stuff for fans. I forgot all about it. Damn. This makes me feel old and senile. Congrats George on the win. I hope they gave out two trophies so you don't have to share. Out of curiosity (as a long-time reader and fan of yours), I was wondering if you have an opinion about the statuette controversy? Obviously you have some history with the Award, having won in previous years and being proud of displaying it, and I imagine you're a fan of HPL himself. I just didn't know if it's something you're trying to stay out of until the dust settles (which would totally make sense) or if you're either for or against changing the statuette? I like the statuette. I count myself a Lovecraft fan, and a fan of Gahan Wilson, the sculptor, as well. Yes, the bust is ugly, but strikingly so, and that's part of its charm. It was always meant to be a caricature, and to be it evokes the Deep Ones and Easter Island as much as HPL's own facial features. For all his flaws, Lovecraft's work seems to have stood the test of time, and influenced many later writers, myself included. And his best stories are very good indeed. He died eleven years before I was born, so of course I never knew him... but those who did tell us that he was a kind and generous soul, a gentle man as well as a gentleman. That counts for a lot with me. There are some ugly passages in some of his work, that cannot be denied, but from what I've read, HPL was never less than courteous towards those he encountered in real life. Thank you for taking the time to answer! A lot of people have really strong emotions about it one way or the other, and for good reasons in both cases. I love HPL as well! It's definitely true that his work is formative despite his less-than-savory opinions on certain topics. It's a good point to look at his actions as well as his written opinions, though. But I listened to many of the other stories and found them to be amazing! The voice actors gave fantastic performances of these well written pieces. From this anthology, I found Wildcards and read the first two books. I have no idea how I missed them all these years. I also read Cecelia Holland's The Secret Elenor. I have 'At the Mountains of Madness' on my reading list and am looking forward to getting to it. Somewhat belated congratulations on the win to you and everyone who contributed to Dangerous Women. To be perfectly honest, I didn't read the whole thing (I checked it out of my local library, and there was no way I could renew it because the waiting list was already a mile long by the time I got it an it only got longer behind me by the time the due date arrived). In any case, I did manage to read a pretty decent chunk of it, and I liked most of what I read. One of the great things about anthologies like this is it gives one a chance to sample works one would otherwise never encounter. As a fan of jimbutcher, I had to pick it up for "Bombshells," and as a fan of your work, I had to pick it up for "Princess and the Queen." But I also wound up enjoying things I wasn't expecting to enjoy - mistborn's "Shadows for Silence in the Forests of Hell" and Joe Abercrombie's "Some Desperado" in particular stand out. And it's a good thing that it wasn't purely science fiction/fantasy anthology, because otherwise, I definitely never would've read Megan Abbott's "My Heart is Either Broken,” or Lawrence Block's "I sure know how to pick them." The later in particular... I'm not sure I necessarily liked it per se, but I could appreciate it for the well-written work that it was. But I'm rambling a bit. Once again, congratulations on a well-deserved win. One of the things Gardner and I love most about doing these anthologies is introducing readers to great writers they had not previously sampled... especially when these discoveries cross genre boundaries. Try ROGUES next. It's just as good.